Ground maps are essential for navigation under the Visual Flight Rules- in fact they are required to be carried on a cross-country. The maps, or charts, used for air navigation are overlaid with a coordinate grid showing the local meridians of longitude and the parallels of latitude. In aviation locations are generally defined in terms of latitude and longitude and chart directions are referenced in relation to true north, but unfortunately the prime navigation instrument � the compass � aligns itself with the magnetic north pole. Parallels of latitude are imaginary circles drawn around the Earth starting from the equator and reducing in circumference toward the poles. Parallels are identified by the angle which they subtend with the centre of the Earth (measured in degrees, minutes and seconds) and whether they lie north or south of the equator. The South Pole has a latitude of 90�S. The equator is a great circle in that it is formed by a plane that passes through the Earth's centre, thus bisecting the Earth's sphere. Meridians of longitude are half great circles, perpendicular to the equator, that extend from pole to pole. The meridians are identified by the angle which they subtend with the centre of the Earth, measured in degrees, minutes and seconds east or west, from the 'prime meridian. 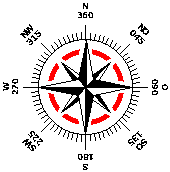 The prime or zero meridian � 0� longitude � passes close to Greenwich, England. Subsequent meridians are identified as �East or �West around to 180�. One nautical mile is the length, at the Earth's surface, of one minute of arc of a great circle and the International Nautical Mile is 1852 metres or 6076.1 feet. Consequently one degree of latitude (measured along a meridian) has an equivalent surface distance of 60 nautical miles and one second of latitude is about 31 metres. However seconds of arc are not used in aeronautical publications, latitude and longitude being expressed in degrees plus minutes to two decimal places. 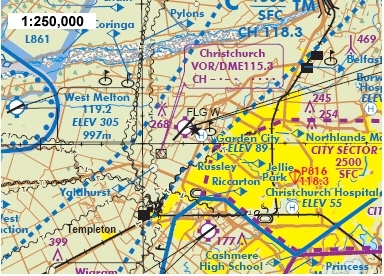 For example Te Kowhai airfield north of Hamilton is located at S37�44.42' E175�09.31'. In ultralight navigation accuracies down to one hundredth of a minute (18.5 metres) are generally unnecessary so we round up/down to the nearest minute. 'Lat/long' coordinates should be expressed with the direction from the equator/prime meridian first (S and E), then a group representing the degrees ( S37� and E147�) followed by a group for the minutes ( S37�44' and E175�09'). A knot is a speed of one nautical mile per hour. A map intended for air or marine navigation is a chart and the chart graticules are latitude and longitude, with the meridians more or less vertical on the sheet. As the Earth is a sphere there has to be a technique to map the image of the surface of the 3-dimensional sphere onto a flat 2-dimensional chart without overly distorting the represented areas. The most suitable method for aeronautical charts is 'Lambert's conformal conic' projection which, although distorting areas a little, allows that the great circle arc, the shortest distance between two points on the surface of a sphere, is accurately represented by a straight line drawn on the chart, and distances anywhere on the chart have the same scale. The meridians on such charts taper towards the poles; on a southern hemisphere chart the meridian spacing at the bottom of the sheet is noticeably less than that at the top. Also you can see that the parallels are slightly curved. If you draw a straight line diagonally across the chart the angle that great circle route subtends with each meridian varies slightly across the chart. No distortion of distances between any two points. The central meridian is vertical on the chart, aligned N-S.
For all practical navigation purposes, distances and headings can be taken directly off the chart. The scales used for aeronautical charts are the representative fractions 1:1 000 000, 1:500 000 and 1:250 000. The latter scale means that an actual distance of 250 000 centimetres (2.5 km) is represented by one centimetre on the chart. Directions on air navigation charts are always expressed as the angular distance from the North Pole � true north � in whole degrees from 0� at north clockwise to 360�, i.e. north is both 0� and 360 � (though usually expressed as the latter), e.g. the direction due east from a particular location is 090�. These directions may be described as bearings, headings, courses or tracks depending on the application. Directions are usually associated with distances expressed in nautical miles thus the bearing and distance of a location 55 nm due east would be expressed as bearing 090�/55. For the purposes of aerial navigation the shape of the Earth is defined by a particular model known as the World Geodetic System 1984 [WGS84] which provides the horizontal datum for the chart coordinate systems. Some charts may also show the Geodetic Datum of 1949 [GDA1949] as the datum but this, for all practical navigation purposes, is identical to WGS84. The projection employed � NZMG projection for New Zealand aeronautical charts. The coordinate system � Latitude and longitude for air navigation. The geodetic datum � WGS84 [or GDA1949] is the standard horizontal datum for New Zealand aeronautical charts. When using a GPS ensure that these three formats have been correctly selected, particularly the WGS84 datum. 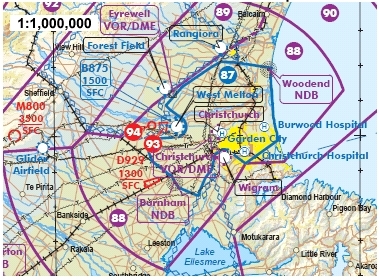 New Zealand aeronautical charts use the New Zealand Ellipsoidal Geodetic Datum 2000 (NZGD2000) rather than Mean Sea Level as the reference altitude. As the name suggests, ellipsoidal heights are measured in relation to a reference ellipsoid rather than sea level. For NZGD2000 this is the Geodetic Reference System 1980 (GRS80) ellipsoid. The geoid is a notional surface, within the Earth's gravity field, of equal potential gravity which describes the Earth's irregular shape, approximates with msl at the coastline and extends under the continents. The geoid is not the same as the ellipsoid [a smooth, slightly flattened sphere] which mathematically represents the Earth's underlying shape. There are many ellipsoids in use but that of most interest to aviators is the WGS84 ellipsoid used by the global navigation satellite system. The difference in elevation of a particular point on the Earth's surface, when measured against both the ellipsoid and the geoid, can be quite considerable; this is known as the geoid-ellipsoid separation, the extent of which is indicated in the image below. Global navigation satellite systems (eg, GPS) produce ellipsoidal heights. This is because mathematical calculations on the ellipsoid are simpler to carry out than on the undulating mean sea surface. Some GPS receivers will output heights in relation to sea level, however to derive these they will have applied a geoid model to transform the ellipsoidal heights. 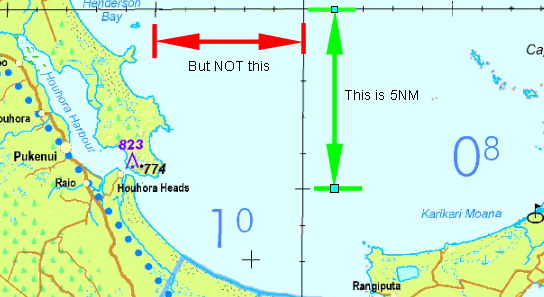 The International Civil Aviation Organisation specifies that the local value [known as the 'N value'] of the geoid-ellipsoid separation should be shown on aeronautical navigation charts but the values are not shown on new Zealand charts. 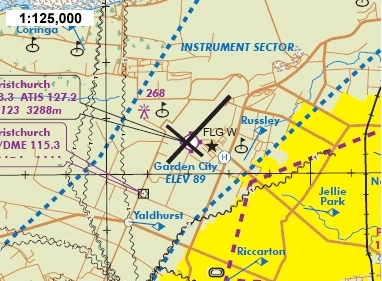 The local N value is of little significance to recreational aviators (although it should be noted that a GPS instrument may give an apparently incorrect height if the software doesn't adjust for the local 'N' value) but may be of great significance to IFR pilots and designers of GPS approaches when GPS achieves sole-means navigation status. In practical microlighting visual navigation applications, the difference between NZGD2000 reference and Mean Sea Level is not significant. In Northland you may be 35m closer to the ground than you thought you were- just look out the window when you are landing!. Visual Planning Charts (VPC). These are two 1:1,000,000 charts on a single double sided sheet covering New Zealand- North and South islands. They are intended for pre-flight planning of routes, distances and time estimates. They do not have detailed low-level and terminal airspace information, and should not be used for in-flight navigation. Visual Navigation Charts (VNC). These are a series of charts of varying scales- 1:500,000 (B series), 1:250,000 (C series) and 1:125,000 (D Series). They contain detailed and complete information on airspace below 9500 feet, and are intended for pre-flight planning and in-flight navigation. The charts are updated on any significant change in airspace or navigation information. 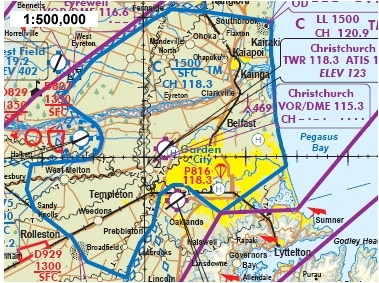 It is a good idea to have all the charts covering your intended area of operations- the smaller scale charts (1:500,000) are suitable for less complex airspace areas, but the large scale charts (1:250,000 or 1:125,000) allow you to 'zoom' in on critical areas with great detail and clarity- very useful around CTRs. Maximum elevation figures (MEF) for each 15 minute quadrangle. Detailed contours, elevations and spot heights. Main roads, rivers, rail and transmission lines. Certified airfields, frequencies, elevation, length and vector. Special airspace- GFAs, SPAs, MBZs, transit lanes, restricted areas, danger areas, MOAs- and conditions of entry. The VNCs are essential flight planning and navigation tools- you are well advised to keep a personal set covering the areas you fly. And it is important that you update on each revision- bad information can be more dangerous than no information. VPCs and VNCs are available from most aero clubs, some microlight clubs, or direct from Airways at the AIP shop. (4) for night operations, an operable electric torch for every flight crew member. Aircraft operating under the VFR must navigate by visual reference to the ground. The lower the level at which a flight is planned the more important it is that the pilot is able to visualise a three dimensional image of the terrain from the graphical details presented by the two dimensional topographic chart � by the usage of colour, symbols and lettering. To assist this visualisation VNCs display tinted topographic contours signifying surface areas from MSL to 500ft and thereafter at 1000ft intervals . The shape of the contours and the width between them indicates the form of the land and the gradient. The closer the contour lines (i.e. the narrower the colour bands) are to each other the steeper the gradient. In addition, the maximum elevation figure (MEF) within each 30' x 30' chart graticule is recorded in bolder lettering than other spot elevations. The elevations are shown in thousands (large numerals) and hundreds (samller numerals) of feet- eg 15 means 1500 feet. Vegetation is shown on VNCs as well as towers, spans and similar obstructions to low flying aircraft. Railroads, rivers, power transmission lines and major roads are depicted. The basic navigation instruments are the magnetic compass and the watch. The 'standard' compass is essentially a bar magnet freely suspended in a lubricating fluid designed to damp out oscillations, vibrations and swings caused by aircraft accelerations. The bar magnet, which may be a needle or part of a circular compass card, aligns itself with the Earth's local magnetic lines of force with the north seeking end pointing roughly north. The Earth's magnetic field is systematically surveyed so that the difference between the direction at which a compass points (magnetic north) and the direction of true north is measured. That difference is called variation, or declination if you are of a scientific bent, and is expressed in degrees of arc east or west of true north. The magnetic lines of force at any location may also be substantially varied by local magnetic anomalies, substantial iron ore deposits for example. Lines on a chart joining locations with equal magnetic variation are called isogonals, or isogonic lines, and are shown on VNCs, at one degree intervals, as dashed purple lines. The local variation may also be shown numerically on some charts. The isogonals on New Zealand charts vary from 18� east in the north to 23� east in the south. This means that if you want to fly from A to B the direction ascertained from the chart will be relative to true north � the true course � and let's say it is due west, 270�. If you then set 270� on the aircraft compass and fly that heading then your track over the ground will not be due west but will vary according to the variation. Let's say the variation is 20�east then the true course you are flying will be 290�. This small complication requires that when you have finally calculated the true course you have to fly to get from A to B, after allowing for the effects of wind, then you need to convert it to a magnetic heading. Variation west, magnetic heading best. So if the local variation is 20� east the magnetic heading will be the true course minus 20�, e.g. true course 010�, magnetic heading 350�. For all wind velocities, given in meteorological forecasts and actuals, the directions are relative to true north, except if you happen to hear a broadcast from a CTR tower controller (or an ATIS � Automatic Terminal Information System � broadcast) who provides the wind direction as magnetic, because the airfield runway numbers are relative to magnetic north. For further information on variation/declination I suggest you read Chris Goulet's FAQ page. Also have a look at the magnetic variation Java applet in Pangolin's 'Almanac On-Line'. This New Zealand company is associated with marine rather than aviation activities but their 'Almanac On-Line' has some interesting Java applets. Your browser must be Java enabled but if you are able to use FoilSim you should be OK with the Pangolin applets. Aircraft compasses are also deflected by magnetic fields within the aircraft, some related to ferrous engine/structural metals, others related to electrical currents. These aircraft magnetic fields produce heading errors � compass deviation � which vary according to the aircraft course, either reducing or increasing the Earth's magnetic field. These errors can be quite significant, 30� or more, and any magnetic field within about one metre of the compass may have a discernible effect. Mobile telephones in the cockpit may also affect the compass. 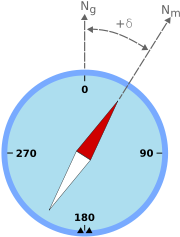 Compass error is the combination of variation and deviation adjustment necessary to determine the compass heading which will provide the true course. A bar magnet aircraft compass will have screw adjustable compensating magnets to negate or at least reduce the effect of these magnetic fields. The compass, and aircraft, must be 'swung' to make these adjustments and the residual deviation errors are noted on a compass correction card displayed in the cockpit. A procedure for 'swinging the compass' is contained in the Australian regulation CAO108. We will go further into compass deviation in the enroute adjustments module. Bar magnet compasses are also affected by vibrations, aircraft accelerations, inertia and centripetal force when turning; and thus tend to be constantly shifting. Compass acceleration errors are most apparent when the aircraft is on an east/west heading and least apparent when on a north/south heading. The turning errors require the pilot to make an undershoot/overshoot adjustment when changing heading. To overcome these errors a magnetic compass may be accompanied by a gyroscopic instrument which indicates the direction in which the aircraft is heading, without being subject to external forces. This electrically or suction operated 'DG' or 'DI' is initially aligned with the compass before take-off and needs to be realigned occasionally during flight; however very few ultralights are equipped with a DG. Electronic flight information systems [EFIS or 'glass cockpits'] are now becoming much cheaper and thus a reasonable proposition for amateur-built light aircraft. These systems use solid state electronic componentry plus software to present a cockpit display incorporating the functions of most single flight instruments. In such systems magnetic field strength sensors [magnetometers] are used to provide a three dimensional magnetic compass which displays magnetic heading without acceleration, attitude or turning errors; thus it also incorporates the directional gyro facility. Marine navigation charts normally use Mercator's (a 16th century Flemish geographer) cylindrical projection where rhumb lines are straight and great circle plots are curved. If you want to see how a great circle route appears on such a chart I suggest you use the magnetic variation Java applet in Pangolin's 'Almanac On-Line' and indicate a great circle start point at Sydney, Australia and an end point at London, England. A rhumb line is a line drawn so that it crosses the meridians at a constant angle, but it is not the shortest distance between two points: an aircraft flying a constant heading would be following a rhumb line course. The concept of choice between a great circle or rhumb line route is interesting but inconsequential to a light aircraft navigator. Maps that lack contours, like street maps, are planimetric - i.e. flat. Large scale maps are those with a scale of 1:70 000 or less. 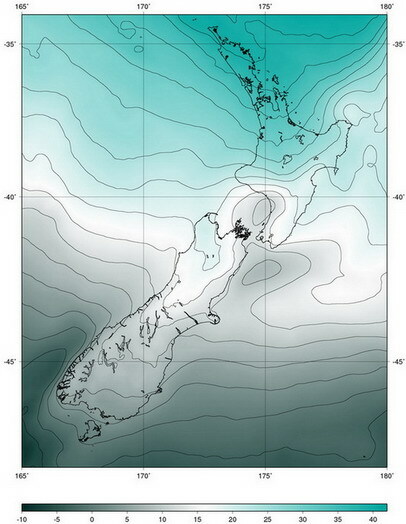 The precise WGS84 latitude and longitude of any apparently fixed surface feature in New Zealand varies with time as the tectonic plates collide and slide from Fiordland to East Cape at a rate approximating 5cm per year. The shortest distance between say Auckland and Los Angeles is a straight line [a tunnel] joining those locations and passing through the Earth. The great circle route follows that tunnel on the surface.